Directed by Danish Nawaz and written by Rukhsana Nigar, the star-studded cast of Paimanay includes Fatima Effendi, Eshal Fayyaz, Asad Siddiqui and Danish Nawaz, Asad Siddique, Imran Ashraf and, Farhan Ali Agha among others. The story revolves around a young girl, Seerat, who chooses to trust her best friend’s advice rather than her family and ends up paying a huge price for it. Seerat (Eshal Fayyaz) falls in love with an auto driver (Asad Siddiqui) and marries him against the will of her family. 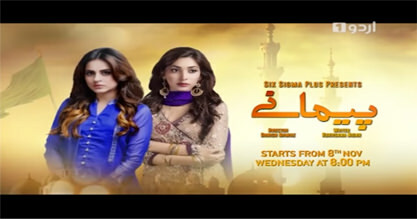 Fatima Effendi is playing the role of the evil best friend Aiza in the tale and, from the looks of the promo, will create a chaos in Seerat’s life. Farhan Ali Agha will be seen as the heroine’s brother and will throw her out of the house when she marries her love interest. Imran Ashraf will be once more mesmerizing the audience in the character of Jazib. We are predicting that Aiza has his eyes on him and will be conniving against Seerat’s marriage to him. The drama seems quite twisted and mysterious, something we are definitely looking forward to.